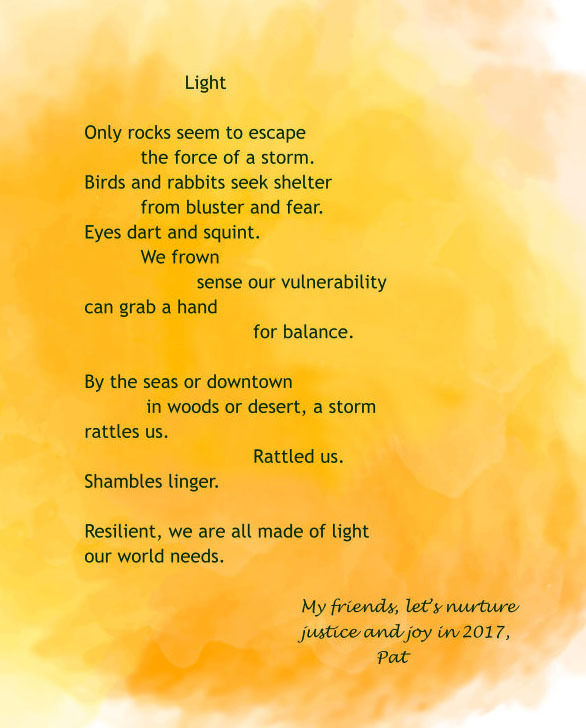 Poet, author, and literacy advocate Pat Mora sent her poem “Light” as an invitation to her friends and colleagues to “nurture justice and joy” in the new year. She also posted it to her blog. While Pat’s poem captures the heart-felt sentiments of many as 2016 draws to a close and 2017 begins, her words are also a call to action. How can educators work in collaboration to build trust? How can we start with our immediate school community and extend our message out into the larger world? These are just three examples of positive messages that students, educators, and organizations are sharing. As leaders, school librarians can collaborate with other members of their school learning communities to broadcast positive messages—messages of kindness, inclusion, and connectedness. 2014-2015 fifth-grade students at Collier Elementary School in Tucson, Arizona raised funds and designed a “legacy mural.” It was installed in a prominent place for all learning community members to see on the front of the school building. Students chose the title and theme for the mural: “Kindness Counts.” See the YouTube video about their project. In his December 10, 2016 post “On the Other Side of the Screen” former principal, author, and blogger George Couros encourages educators and young people alike “to go out of our way to make a positive impact on the lives of others” (Couros). In his post, Couros shared a way that Pulaski Middle School in Pulaski, Washington is using their twitter account to share positive messages. Using the hashtags #positivepcms and #raiderstrong, school community members publicizing sincere praise and positive comments about individuals and concepts such as ability, motivation, and attitude. During the week of February 6 – 10, 2017, participants will raise awareness and educate students and the community through “Start with Hello” trainings, advertising, activities, public proclamations, media events, contests and school scholarship awards. “Start with Hello Week” will bring attention to the growing epidemic of social isolation in our schools and communities. Their goal is to empower young people to create a culture of inclusion and connectedness within their school or youth organization. • Who are my most trusted colleagues? • How can we inspire and support each other and students in increasing the positive messages in our classrooms, libraries, schools, and communities? • Do any of the above examples give us an idea how our school can make a commitment to kindness, inclusion and connectedness? “Learning the truth is not a goal, but a process” (Inskeep). The process involves keeping our eyes, ears, hearts, and minds open and thinking critically. It also involves making a commitment to bring more caring, truth, and justice into the world. If you need any further inspiration for what the world needs now, read Karim Sulayman’s sign and watch his “I Trust You” video. Saturday, December 10th, was the United Nations’ Human Rights Day. Making the connection between human rights and finding “harmony in difference” feels like a timely post for me. In 1992, when I was serving in my first school librarian position, my father-in-law gave me a copy of the Southern Poverty Law Center magazine Teaching Tolerance. Founded in 1971, SPLC is a U.S. non-profit organization monitors the activities of domestic hate groups and other extremists. Shortly after reading my first issue of Teaching Tolerance, I became a card-carrying SPLC member and have religiously renewed my membership every year since. Over the years, Teaching Tolerance has given me inspiration, encouragement, and teaching tips to make social justice a central component of my service as a school librarian and school librarian educator. On their “about” page, Teaching Tolerance notes that their definition of “tolerance” aligns closely with the United Nations Educational, Scientific and Cultural Organization’s Declaration of Principles on Tolerance: “Tolerance is respect, acceptance and appreciation of the rich diversity of our world’s cultures, our forms of expression and ways of being human. Tolerance is harmony in difference” (UNESCO). 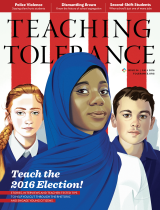 Read the latest from Teaching Tolerance: “New Report: School Climate Worsens in Wake of Election.” More than 10,000 educators took the survey; 90% of respondents reported that their school climate has been negatively affected by the election. 1. If you don’t already have a free Teaching Tolerance subscription, sign up for one or read the magazine online. Sign up for the weekly newsletter. 2. If you receive a print copy of the magazine, share it among your colleagues or send the link to the .pdf version to them. Encourage your colleagues to subscribe to the magazine and newsletter. 3. Engage students and colleagues in discussions related to the articles in the magazine and newsletter. 4. Reflect on your own practice of teaching tolerance. 5. Reach out to colleagues to coteach lessons and units of instruction that affirm diversity. 6. Consider following Teaching Tolerance on Twitter and Facebook. As we approach the winter holiday season, it is especially important that our nation’s “public spaces,” including our school libraries, honor the traditions of all of our citizens and library users. Even in homogeneous communities, and maybe most especially in religiously homogeneous schools, the season for caring and giving is a time to acknowledge that diversity is, thankfully, an essential and laudable aspect of U.S. society. Thomas Jefferson famously said, “An informed citizenry is at the heart of a dynamic democracy.” An informed citizenry must be able to deeply comprehend information in all formats and engage in critical thought and well-reasoned civic decision-making. Before the 2016 election, there were a number of comments on the distribution lists and blogs to which I subscribe related to educators maintaining an “apolitical” stance. In some classrooms and libraries across the country, educators downplayed local, state, and national campaigns in order to avoid confronting “political” issues in schools. 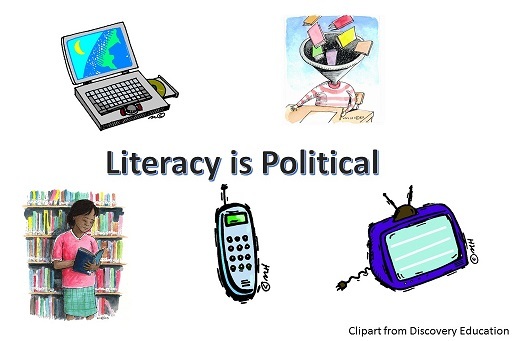 What are the unintended consequences when learners do not wrestle with the political life of our nation in the supportive environment of their classrooms and libraries? How can students and educators practice civil discourse and learn to listen to and share divergent perspectives if political issues are not discussed in schools? While an individual school can be considered a system, each one is not a “closed” system. All public schools function within a larger system—a school district with procedures, curricula, and policies. School districts must respond and work within even larger systems—state and federal bureaucracies and mandates. What happens in the society at-large affects each of these systems. 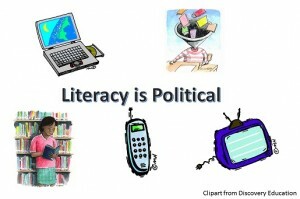 It is, therefore, in my view, important for school-age children and youth to have the opportunity to intelligently and respectfully discuss political issues—not just in high schools and not just in civics or social studies classes. What does “apolitical” mean in a fake news and post-truth world? When political candidates of all stripes and their supporters tell outright lies, mess with the “facts,” or distort the truth, how can educators guide students in an open, respectful dialogue that touches on sensitive topics, including social justice issues? When post-election emotions are running high while results are still coming in or being questioned, what is an educator’s role in responding to these teachable moments? On December 2nd, the PBS Newshour published an article in their “Teachers’ Lounge” column called “Helping Students Understand the 2016 Election Results” In the article, the reporter Victoria Pasquantonio includes quotes from civics, social studies, English language arts, and world history teachers from across the country. I believe this article and the quotes are important reading for all educators who want to help students unpack the recent election cycle. Like Ricky House, 7th-grade civics teacher, in Arlington, Virginia, who is quoted in the article, I would never tell students how to vote nor would I use my influence to tell students what to think about a political issue. On the other hand, I have not and would not hesitate to discuss election issues, such as specific policy platforms, marketing techniques, political activism, voting processes, voter ID laws, the process or effectiveness of polling, the Electoral College, and the popular vote. Some of these discussions could lead to social justice or injustice issues thus providing students with opportunities to think about policies, laws, and the Constitution and how they might be changed or interpreted for the betterment of society. The National Institute for Civil Discourse is a non-partisan center for advocacy, research and policy. To support civil discourse during the last election cycle, they offered a program for high schools called “Text, Talk, Vote.” School librarians and classroom teachers who are teaching digital literacy through social media may want to adapt this program. Form instructional partnerships with trustworthy colleagues. Consider coteaching with educators who do not share your perspective and respectfully use your divergent thinking as a resource for learning. While coteaching, collaborative partners can provide each other with a bias-check before, during, and after instruction. Model civil discourse and guide students’ practice of civil discourse when discussing controversial issues.